The Community Foundation for Loudoun and Northern Fauquier Counties recently received accreditation with the nation’s highest standard for philanthropic excellence. National Standards for U.S. Community Foundations establish legal, ethical, effective practices for community foundations everywhere. The National Standards for U.S. Community Foundations program requires community foundations to document their policies for donor services, investments, grantmaking and administration. With more than 500 community foundations accredited nationwide, the program is designed to provide quality assurance to donors, as well as to their legal and financial advisors. The Community Foundation for Loudoun and Northern Fauquier Counties works to meet critical community needs and support local causes. Since founded in 1999, the organization has established more than 70 charitable funds, exceeding $6 million in grants to nonprofit organizations addressing community needs such as human services, health, education, nature and environmental conservation, historic preservation, and more. In addition, the Community Foundation for Loudoun and Northern Fauquier Counties has been a leading voice for philanthropy in Loudoun and Northern Fauquier, spearheading the Faces of Loudoun awareness campaign, creating Give Choose, an annual day of online giving that has raised almost $900,000 for local nonprofits, and convening local stakeholders and philanthropists with its annual Philanthropy Summit. The Community Foundation for Loudoun and Northern Fauquier Counties offers a range of charitable funds, allowing donors to advance a cause, support an individual organization, provide flexible support for community needs or recommend individual grants. 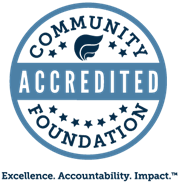 In addition to affirming the organization’s philanthropic services, the accreditation validates the Community Foundation for Loudoun and Northern Fauquier Counties’ grantmaking practices for the nonprofit community. National Standards for U.S. Community Foundations is the first program of its kind for charitable foundations in the United States. Recently, the Community Foundation for Loudoun and Northern Fauquier Counties also achieved a Platinum Seal of Transparency rating from GuideStar, the highest recognition an organization offered by the online nonprofit information service. In 2017, the Community Foundation for Loudoun and Northern Fauquier Counties was named Nonprofit of the Year at the Loudoun County Chamber of Commerce Small Business Awards, and in 2018, President and CEO Amy Owen was named Entrepreneur of the Year.